I think it’s straight ahead! At breakfast in the hotel, we met a chap from California who was doing the Camino on a mountain bike. It was interesting getting his perspective of the experience from that angle. Both Greg and I felt like staying in Burgos for another day, or at least lingering awhile longer this morning, but we knew that there was a long day ahead, and the weather already looked somewhat threatening from the windows inside the hotel. Time to pack up and get underway. We got our bags down to the lobby area and set out into the city to find the Camino and head west towards Hornillos. We picked up the Camino easily, and by the time we were passing the Cathedral, the rain started coming down. We stopped to pancho up and talked to some fellow pilgrims that were doing the same, but were then moving down to the Cathedral to see it for the first time. Just then our bicycle friend from breakfast happened by and waved to us. Going through Arco de San Martin, the rain was really coming down hard, but by the time we got to Hospital del Rey and the University there, it had let up some. Just past the juncture to Villabilla, the rain picked up again and we saw some pilgrims seeking shelter under a large tunnel that went beneath one of the major highways. We kept moving, crossing the A-231 towards Tarjados. It was here that we had planned to stop and eat lunch that would consist of fruit and bread scavenged from the hotel. Just into town, we found a shelter that was actually a bus waiting area, and we hunkered into this place to get out of the rain and eat. Enclosed bus-stop shelter. Great for eating in the rain. In Rabe de las Calzados, we stopped at a small café/bar and ordered a coke which we took to an outside table, since the rain had let up briefly. The bartender was quite rude to me, and I could not figure out why. He just seemed irritated in general. While at the table, we observed a young American girl that we had seen from time to time. At first she was moving quickly and easily on the Camino, but now she was struggling with a major limp. I had tried to engage her in conversation in previous encounters, but she was not interested. This was just one of many younger people that we encountered along the way who seemed to start out invincible but found that this trek was far more strenuous than they had expected. They were hobbled with pulled muscles and blisters by now. We went at a slower, more deliberate pace and rested often. 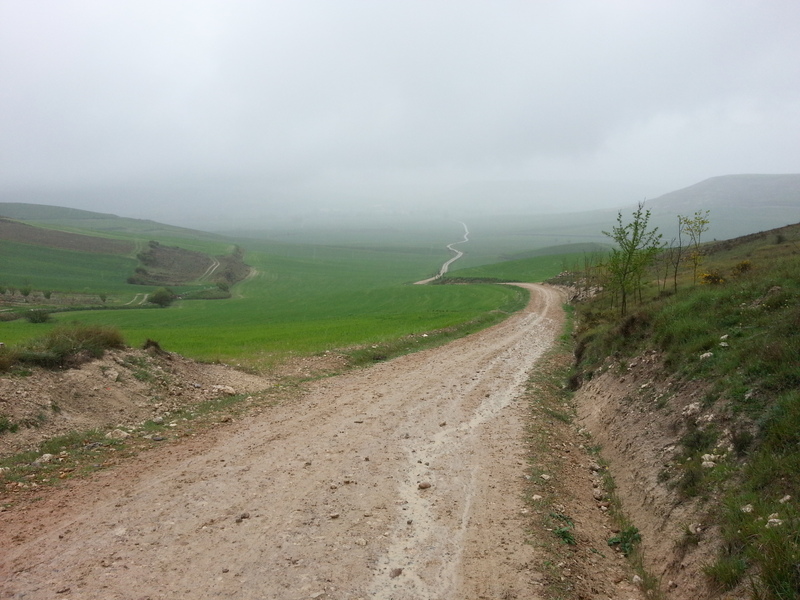 After Rabe, we climbed up onto the Meseta and the rain came down again. Greg moved out ahead on the hill up and soon I lost sight of him. I continued slogging along the muddy trail. All this time I was thinking about how we would find our hotel later on. Our notes told us that when we got to Hornillos we were to call the hotel owner whose place was in the town of Isar, about three kilometers to the north. He would then come and pick us up. Since we had no telephone, we were going to have to find a café and ask the bartender there to call for us. This was going to be a challenge, given my poor Spanish, but somehow we would get through it. 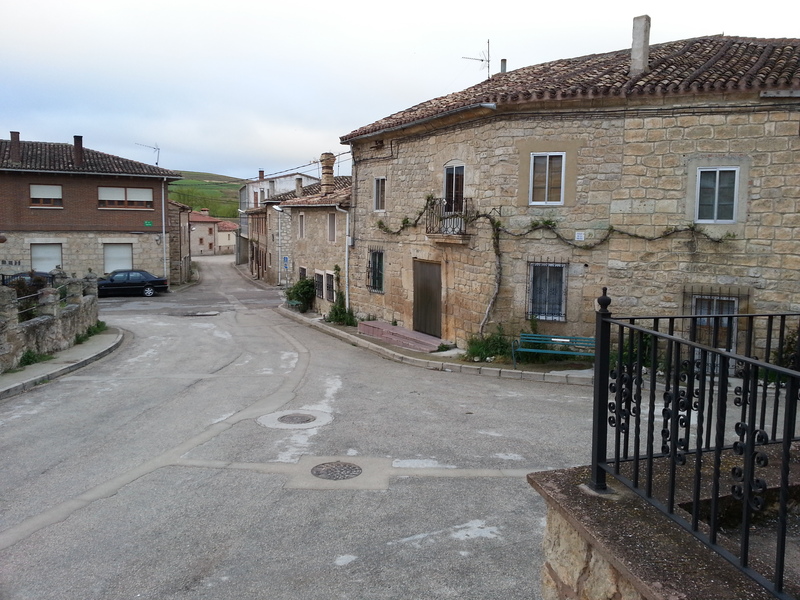 This was one of the more lonely days for me, because once I was up on the Meseta, I was generally walking alone with no one around for about two hours. 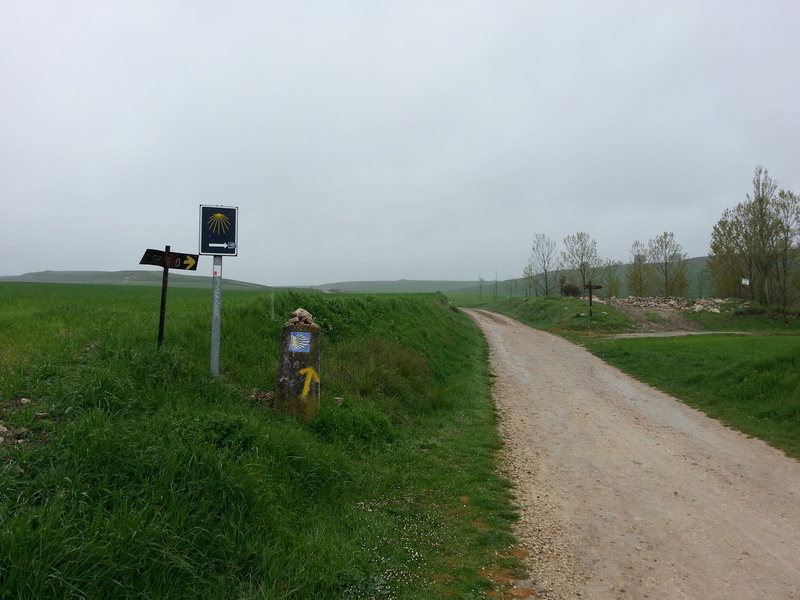 Eventually, the Camino dipped down and led into a long 3 kilometer finish into Hornillos. When I entered the town, I was wet and tired. After a block or so I saw Greg who was talking to two fellow pilgrims. As it turned out, they were a middle-aged Irish couple who were more than happy to dial up our hotel number for us with their cell phone. The woman handed the phone to me and I talked with out host who spoke rudimentary English. He said he would be there in approximately ten minutes to pick us up. We continued the conversation with the Irish couple who told us they had been on the Camino previously. The wife had experienced a severe injury and they had to quit and return home. Now she had been completely rehabilitated and they wanted to come back and finish. We thanked the couple again as our host pulled up, loaded our packs and took us away to Isar. 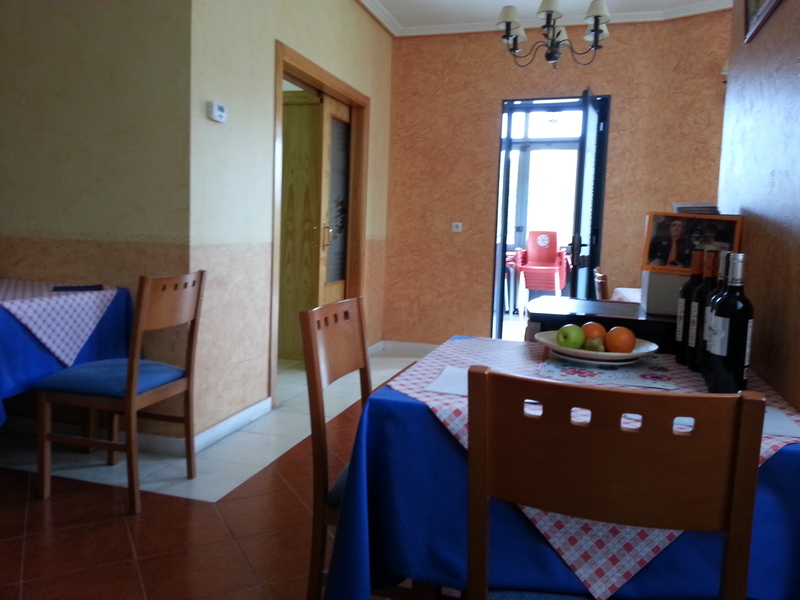 From the guest house in Isar. The three kilometer trip to the hotel was exceedingly short since our driver had a lead foot, to say the least. I was in the front seat holding on for dear life. But we got there safely and screeched to a halt outside a delightful casa rural that had been recently upgraded into a very pleasant hotel. After registering, we were shown our room that was quite spacious, and we began the tedious task of getting our wet stuff off, finding a method of drying everything, and then trying to warm up from the cold and wet day. There were radiators in the room that we used to get our shoes dry by turning them upside down and placing them on top. The rest of the things we wrung out as best as possible so they wouldn’t drip on the floor, and then hung up all over the room on anything that might suffice. The bath consisted of a large tub with a shower hose, but we had plenty of hot water, and we both took long showers and warmed up. I went downstairs to access the WiFi since it did not work in the room.